Properly filling out an hours of service log is a matter of federal law for truck drivers, as well as company policy. The Federal Motor Carrier Safety Administration (FMCSA) requires logs to be current through the last duty status change. Hours of service violations can range anywhere from $1,100 to $10,000 per occurrence, so maintaining your log is necessary to protect yourself and your company. If you're not already, you should be in the habit of filling out your logs daily. It is easy to become complacent or forgetful when filling out these logs. They are not inspected daily by the Department of Transportation (DOT), so it can become a task that is continually pushed to the wayside or the bottom of your list of priorities. That can come back to haunt you later on, though. A DOT officer may cut you a bit of slack if your paper log is not updated to the minute, but then again, he may not. 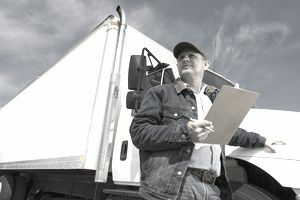 Paper logs will be obsolete by Dec. 16, 2019, as Electronic Logging Devices (ELDs) will be required by that date, and they're already being used by many trucking companies as the industry shifts to the new technology. ELDs use GPS technology to more accurately track drivers. Still, a lot of truckers continue to rely on paper logs, which are sold by a number of companies and also are available at most truck stops. The main part of a typical log is a chart with four sections of 24 boxes, each box representing one hour. The four sections are broken down as such: off-duty, sleeper, driving, and on-duty (not driving). To fill out the chart, you should draw a line through the hours in the appropriate section that represents what you were doing during that time. For example, if you were driving from 8 a.m. to noon, you would draw a line through those four hours of the driving section. Daily logs also typically include sections for the date, the driver's name, the driver's employee number if applicable, shipping numbers, tractor numbers, and hours from the previous seven days. Some logs have numerous sections that don't always need to be filled out, so using such logs and leaving sections blank may raise questions for DOT officers who may not be aware of what a driver has to fill it out or not. For instance, the recap section is not a requirement of the FMCSA. Given this reality, purchase paper logs that have only the basic information on them. If your logbook forms have extra sections for added information that you are not required to fill out, insert a long dash through those sections instead. This can assist during roadside inspections when an officer may not be as up-to-date as possible on logging requirements. The long dash indicates that the information is unnecessary. The main office address typically is the corporate address of the motor carrier. The home terminal is the address the dispatcher issues from. Breakdowns and accidents must be documented at the appropriate time along with the city and state where the breakdown or accident took place. The words "breakdown" or "accident" must actually be written in the log should one occur. Your log must be legible and include your signature. Your log must be turned in to your motor carrier within 13 days according to federal law. Your motor carrier may require logs to be turned in sooner than this. City names must be spelled out completely. No abbreviations are allowed. For example, Indy is not acceptable for Indianapolis. States may be abbreviated. For example, it would be acceptable to write Indianapolis, Ind. If you drive multiple pieces of equipment in one day, every piece of equipment must be listed on the paper log. Initial all changes made to your paper log. Sometimes logs are returned for corrections, and these usually are for minor mistakes, such as the address field not being filled out correctly, missing shipping documents, or driving/on-duty hours not adding up correctly. Penalties for violating hours of service requirements exist for the safety of truck drivers and others on the road. Nobody wants to be driving on highways with tired or overworked truck drivers, and drivers don't want to be overworked by trucking companies that might not otherwise care how tired their drivers are. Still, there's motivation for drivers to work longer than what their log books indicate or for trucking companies to encourage their drivers to do so. Truck drivers often are paid by the mile, so the more they drive, the more money they make. And trucking companies often need to meet strict deadlines, which can motivate them to push their drivers more than they should. There are some red flags that might indicate a falsified log, according to Truck Accident Attorneys Roundtable. For example, if a log shows a trucker drove more than 300 miles in four hours, it's probably not accurate. Either the driver was speeding or he's not being truthful about how much time it took him to over the distance. Another common example are logs that show no variation among multiple runs with the same starting and ending points. There should be similarities each time the same run is made, but elements such as traffic and weather also should cause slight variations. If those variations aren't there, it's a good bet the driver's log is false.